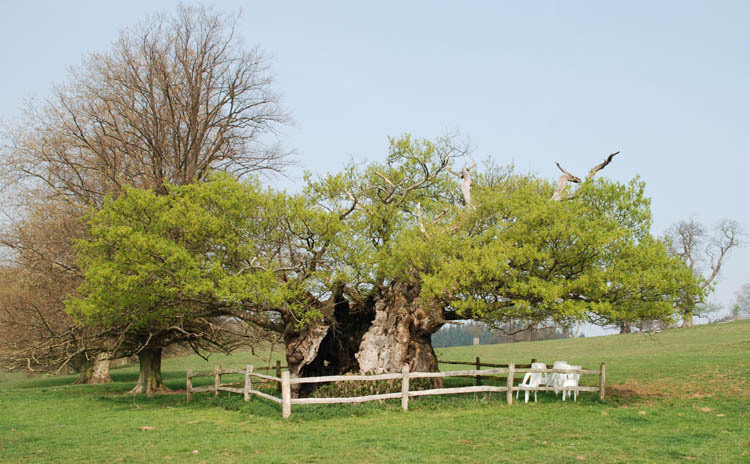 A really ancient veteran is the Queen Elizabeth Oak, a very hollow pollard Sessile Oak (Quercus petraea), in Cowdray Park, near Midhurst. 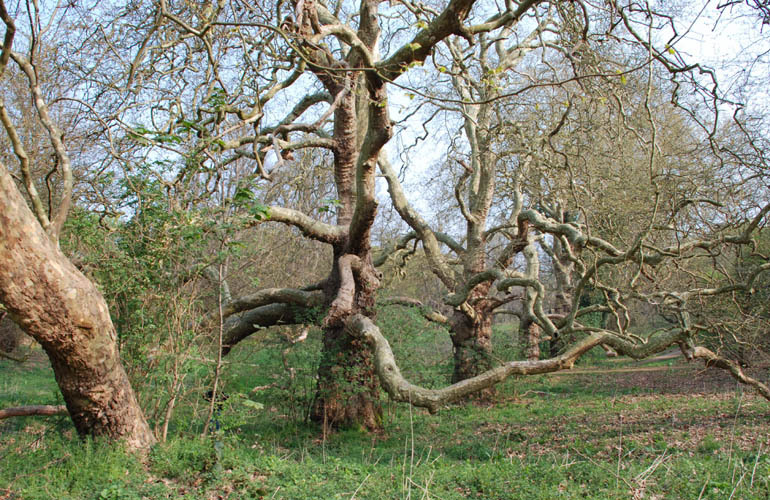 It is the biggest of about ten old pollard Sessile Oaks in the park. 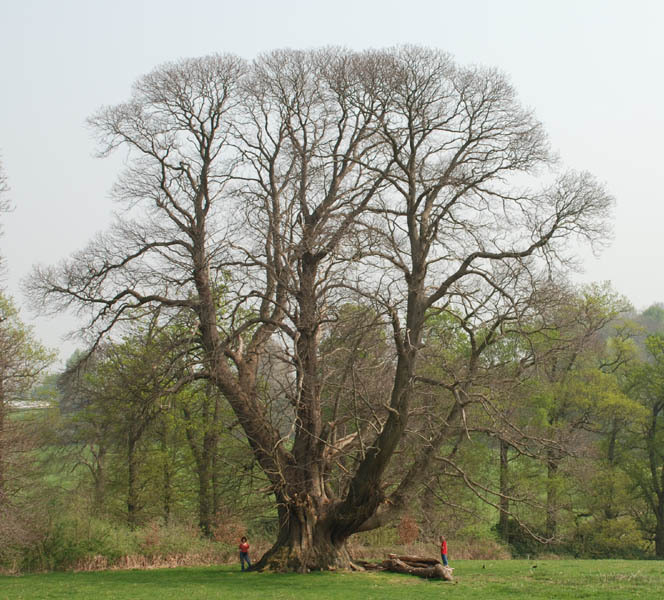 With a girth of 12,53 m (41 feet), (12,8 m / 42 feet @ 1,3m), it is among the 5 biggest oaks even of Britain, probably as well among the oldest. It is thought it could be over 800 years old. The oak got its name while it is said Queen Elizabeth I visited the tree in 1591. 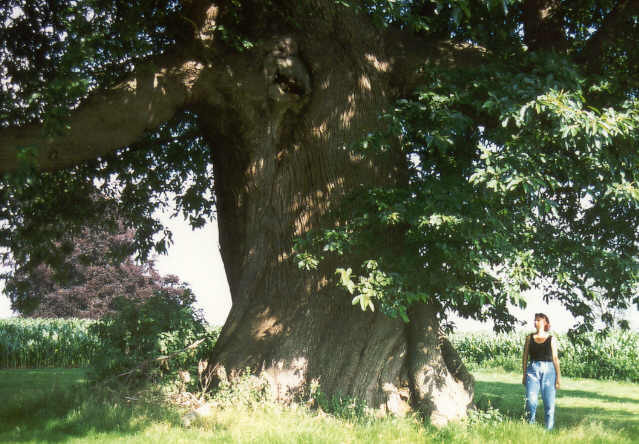 This oak was designated in june 2002 as one of fifty Great British Trees in celebration of the golden jubilee of Queen Elizabeth II because of its place in the national heritage. The tree can be found in a field east of Oaters Wood: walk to the north from the lay-by at the Benbow Pond along the A272 2 km east of Easebourne and pass the fence. The tree is just north of a lily-pond there. The oak looks like a pollard and is only 8 meter tall. On old photos of around 1900 can be seen the trunk was higher. Probably parts broke off because of storms. (nearly 39 feet) and a huge crown, the tree being 26,5 m (87 feet) tall and 33 m (109 feet) wide. 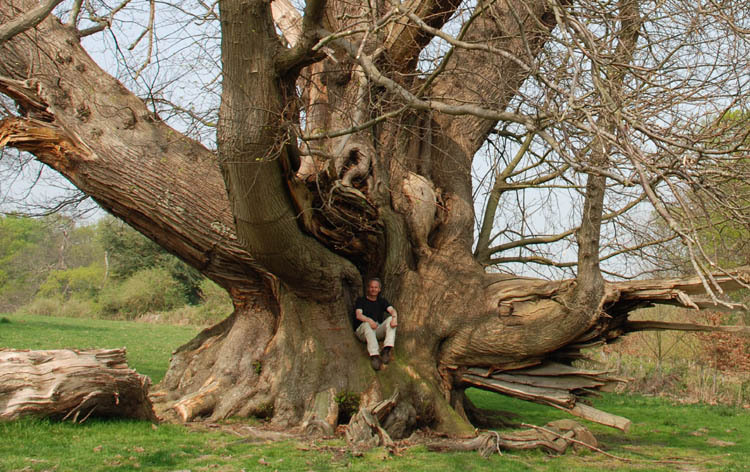 We called it the 'Cowdray-colossus' and it is recognized as a champion-tree by the Tree Register of the British Isles (TROBI). 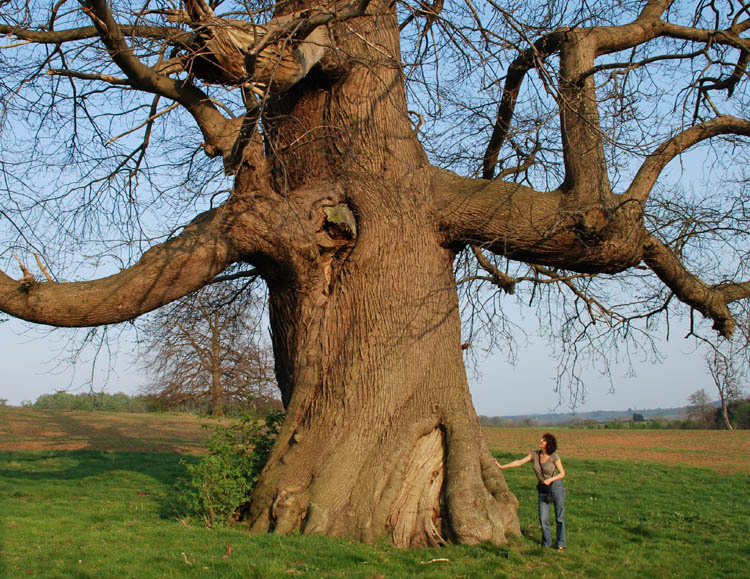 It grows vigorous and could be between 300 and 400 years old, far less than many people would expect of such an enormous tree. As is usual with old, large sweet chestnuts this colossus looses branches and has a wild apearance, as if it is battered by many heavy storms. Nonetheless it is in a good health and can live still for quite a time. 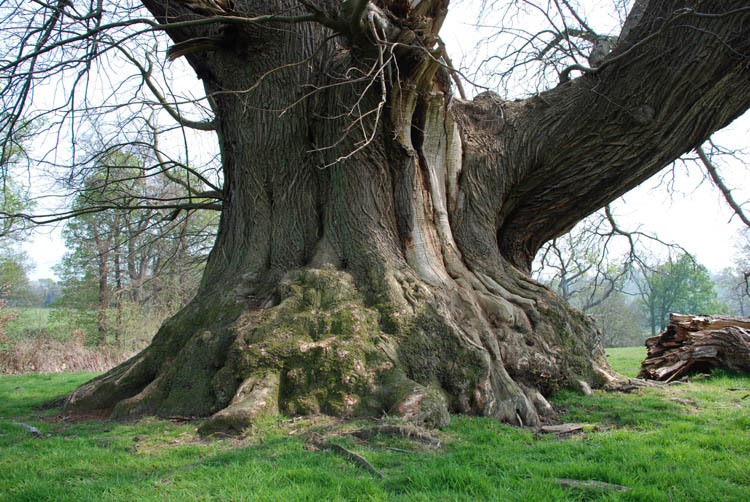 Because of the enormous root-swell the circumference near the ground is over 15 m.
Several other big Chestnuts are to be seen in Cowdray, outstanding among wich is this one with 10 m (33 feet) girth along the A272 at the little road to Moor Farm. I called it the 'Elephant' because of its huge size, the 'eye' on the trunk, the grey 'skin' and the branches suggesting the elephants trunk. This photo with my wife Gerdien is from July 1997. Another photo made om a recent trip in April 2007, with Astrid Werdmuller, chairman of the Zutphen Tree society. In 10 years the tree has grown over 30 cm in girth: just like the other giant chestnut it will not be much older than 300 to 400 years. Near the A 272 just opposite the main gate of Cowdray House is this lovely planting of Plane trees. In spring it has a very light atmosphere with the beautiful twisting branches, layering from the ground again. In the park near Cowdray House, also an avenue of large Giant Sequoias, planted in 1870, can be found. The tallest are over 40 metre while the largest has a girth of 9,9 m. Alas the park is open to the public only at special days in the weekend.